But they should be motivated to stop student rot. There are three reasons why. FixMyStreet.com is a Web site where city residents can take quick, visible steps toward getting city problems fixed. Let's say your neighbor's garbage carts have been overflowing for weeks or the sidewalk down the street is crumbling or your other neighbor just had their fourth loud late-night party this week. At FixMyStreet.com you can report the problem publicly—and, if you want to, pinpoint it on a map with a photo you've uploaded and a brief description. Staff at the Web site quickly reviews your report to make sure it's a complaint that city government can do something about. They make sure you're not a crank. If you check-out, they post your report on the Web site and categorize it by location and type of complaint. If that's all they did, the site might just be a good way to let off steam. But what happens next is key: the Web site reports the problem to the appropriate agency at the city on your behalf and then publicly tracks whether the problem gets resolved. FixMyStreet.com is a Web site in the United Kingdom, and I have no idea whether it's working well or not. A well-managed, well-publicized site like this could be an effective tool for groups pushing for more responsiveness from city government on code enforcement, road maintenance and other quality of life issues. 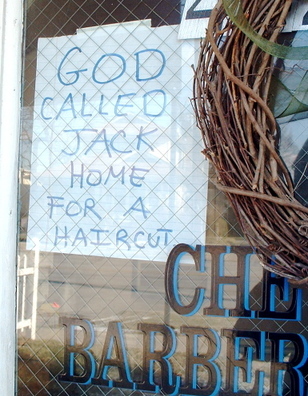 LEXINGTON, KY – Taped to the front door of Chevy Barber Shop at 442 S. Ashland Ave., this note tells customers that Jack Parker, shop-owner and barber, has died. In Oct. 2007, Parker celebrated 30 years of operating his shop at the Ashland Avenue location. His daughter, Leigh Ann Greathouse, is also a barber and will continue to run the barbershop. At Walk Score, you type in an address and within seconds you get a map of your neighborhood and a "walkability score." You also get a handy map and list of all the grocery stores, bars, restaurants, schools, parks, hardware stores and more within walking distance of your address. Do Lexington's leaders understand the value of good city neighborhoods? If reading the local paper lately is any indication, it's not clear that they do. I've read opinion pieces by neighborhood residents complaining about the lax enforcement of parking regulations and building codes. I've read news stories about how developers illegally built condos in federally protected wetlands with city knowledge. About traffic engineers who forgot to paint-in planned bike lanes. About how city agencies easily grant variances for new constructions and repairs that clearly violate official policy. About how the Urban County Council—and a silent mayor—killed recommended historic zoning for a neighborhood that's struggling to maintain its character and distinctiveness.